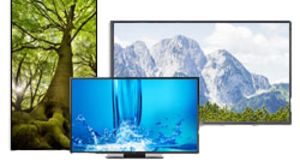 NEC Display Solutions designs, produces and delivers leading-edge visual display technology for a wide variety of markets. We specialize in desktop and large-screen LCD displays, and a diverse line of projectors for customers who demand the most high-quality, reliable display solutions to meet their needs. Whether your customers’ digital signage needs are big or small, many or few, 24/7 or just a couple of hours, NEC’s vast selection of displays are sure to fit the job. Their LCDs are available from entry-grade to professional-grade and tout the latest in display technology. Deliver maximum impact to your customers’ messaging on a single screen or up to 100 displays tiled together in a jaw-dropping video wall. Look to NEC for captivating LCD screens for your business and digital signage applications. NEC's super-large E-Series deliver an cost-effective solution while maintaining an extensive feature set and high visual quality that's expected with commercial grade displays. With their extremely large size, full external control and expanded connectivity, they are the ideal solution for all boardroom, conference room and meeting room type of applications. NEC's X-Series offers 24/7 runtimes and picture perfect image quality make these displays ideal video wall solutions for retail signage, control room application, broadcast environments and rental markets. Brand new S-IPS panel technology provides exceptional viewing angles and top of the line color depth to enhance image quality for all types of installations.